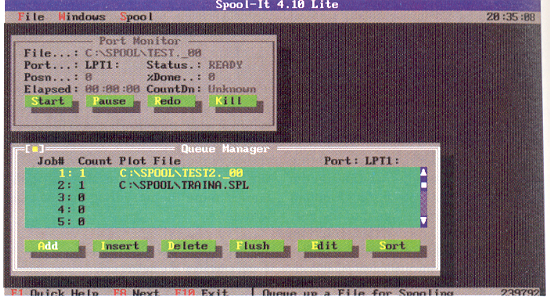 Spool-It was one of the first, and most powerful plot spoolers ever sold in the AutoCAD market. It allowed simultaneous background plot spooling to up to 8 plotters at once, from a single plot server machine. It was also one of the most popular, with sales in the thousands of copies. Until Windows took over as the dominant platform for AutoCAD to run on, generating plots directly from AutoCAD took a great deal of time. However, AutoCAD had the capability to output plot data to file very quickly. Plot spoolers took advantage of this characteristic, and transmitted plot files to plotters in the background, while users continued to work in AutoCAD. Spool-It received critical acclaim from CADence Magazine, CADalyst Magazine, and the MicroCAD Journal. CADalyst said that Spool-It was "one of the most sophisticated plot spoolers tested... has amazing power for a plot spooling program, squeezed into such a small amount of RAM." Spool-It is not an Autodesk product.